The Bird House Mini by KooKoo is a different kind of cuckoo clock: It has a modern, simple design and it is made of high-quality MDF-wood. The little relative of the Bird House is every bit its equal with regard to functionality: At every full hour the cuckoo appears and sounds its call. However, it doesn’t only play the classic cuckoo sounds - there are a choice of 12 different bird calls, from the blackbird to the oriole. All of these calls are original sounds which have been recorded from nature, bringing a lot of life into your home. At night the birds go to sleep. This is ensured by a light sensor, which switches off the birdhouse and the calls in light lower than 10 lux. This means your night’s sleep won’t be disturbed. Four coloured birds are part of the Bird House Mini. One bird at a time can be fixed in the clock using a magnet; the other three can be stored on a magnetic metal rod. 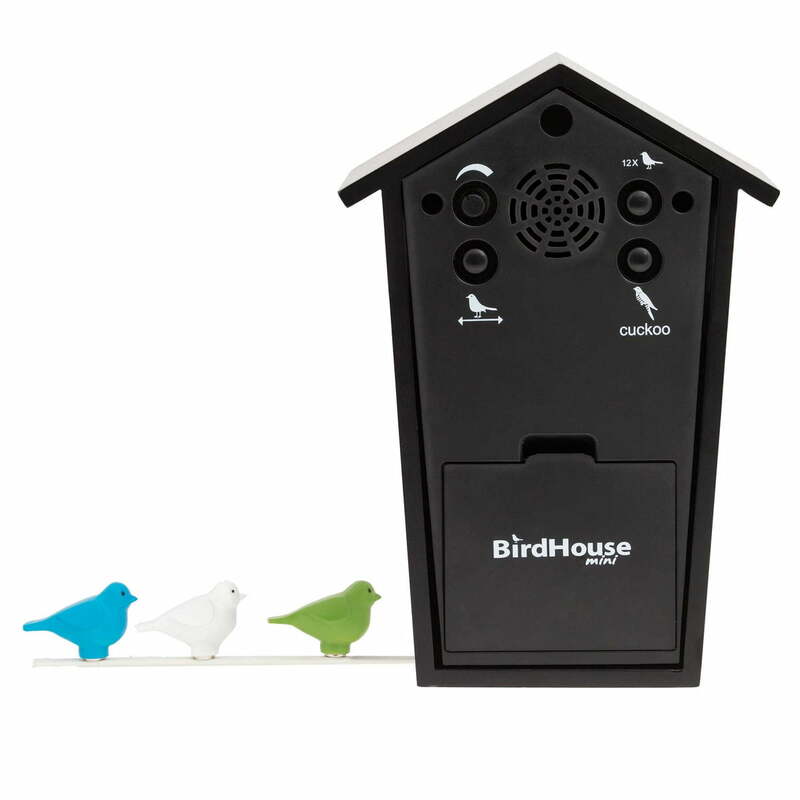 Frontal single image of the Bird House Mini in white by manufacturer KooKoo. 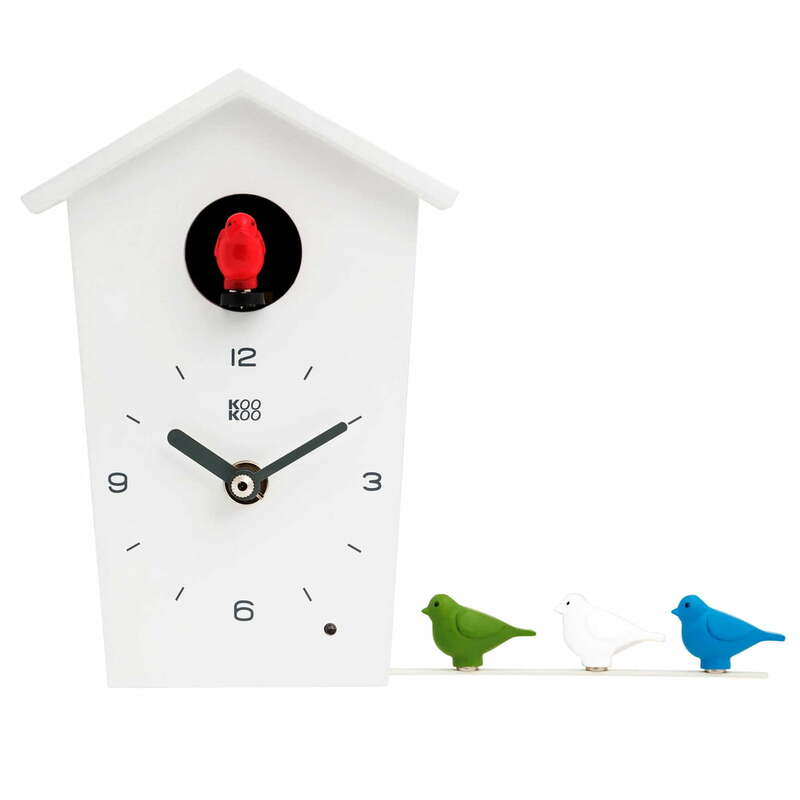 Running by battery, the cuckoo clock has a modern, simple design made out of high-quality MDF-wood. 3 batteries (LR6 AA Mignon 1.5V) are required but not included in the delivery. Detailed view of the back side of the black Bird House Mini with colourful birds by KooKoo. At night, the birds go to sleep as well as we do. Light sensors keep the birds inside of their houses, and their voices switched off at less than 10 lux. Thereby, your night won’t be disturbed. Detailed view of the back side of the white Bird House Mini by KooKoo. Next to the classic cuckoo sound, twelve more bird voices can be selected, staring from the sound of a blackbird up to an oriole.